The mandible (mandibula; Latin, mandere = to chew) is a paired bone that is fused at the symphysis before birth. Symphysis means the bony site where the two halves of the mandible are fused, which lies on the midline of the symmetric bony plate. The parabolically shaped bony plate, as the largest of the facial bones, determines the shape and size of the lower part of the face. The main parts of the mandible are the body and the rami of the mandible. As a single bone, the mandible is attached to the skull by two true joints (TMJs) in a mobile fashion, and it bears the mandibular dentition. Movement of the mandible takes place in these two joints. The TMJs connect the mandible to the temporal bone and guide it in its movements against the maxilla. 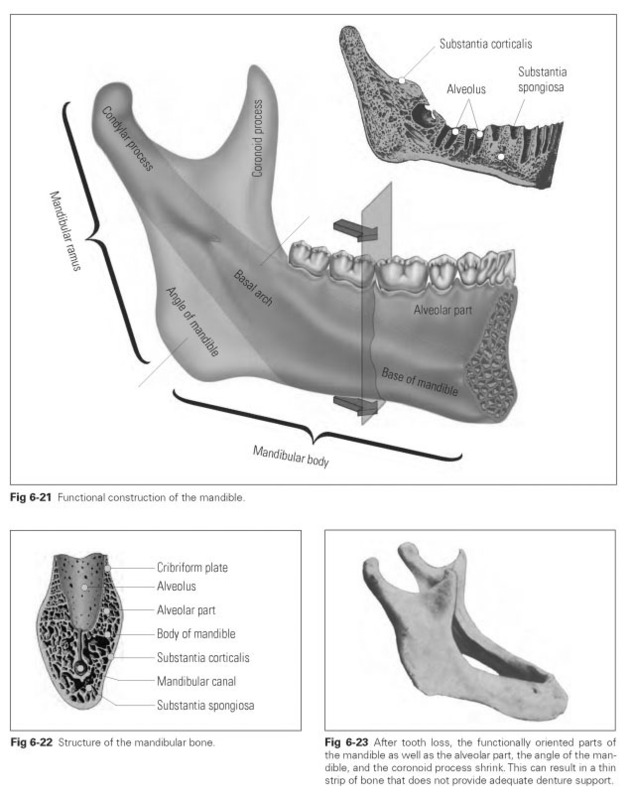 The functional construction of the mandible comprises the basal arch, formed by the condylar process (processus condylaris), the middle part of the ramus of the mandible, and the body of the mandible, which is enlarged in front by the chin (Fig 6-21). The formation of the alveolar part (pars alveolaris) on the mandible results from direct functional stress caused by the teeth; the coronoid process (processus coronoideus) results from the pull of the temporal muscle, and the angle of the mandible results from the pull of the medial pterygoid muscle internally and the masseter muscle externally. The body of the mandible (corpus mandibulae) is made up of the base of the mandible (basis mandibulae) and the alveolar part; it starts at the angle of the mandible (angulus mandibulae; sub-maxillary angle) or at the last molar and runs via the symphysis with the opposite side right up to the other angle of the mandible. The mandibular canal (canalis mandibulae) runs through the body of the mandible, starting at the mandibular foramen on the inner surface of the ramus and extending as far as the symphysis. Blood vessels and nerves supplying the mandibular teeth run through the canal. Some of the vessels and nerves exit at the mental foramen, while the remainder run as far as the symphysis. These nerves are part of the mandibular branch of the trigeminal nerve. The alveolar part (pars alveolaris) is the bony foundation of the tooth-bearing alveolar ridge and displays the typical bony structure: a dense outer bony plate covered with periosteum, an inner bony layer lining the alveoli, and the cancellous bone lying between the compact layers (Fig 6-22). The bony alveolar ridge is where the compact layers of the outer surface and those of the alveoli merge.The outer layer of the alveolar bone is the typical substantia corticalis and is relatively thick here. The cancellous tissue is missing at the roots of the incisors so that external and internal compact tissue layers combine with the alveolar compact tissue to form a uniform bony mass. The cancellous tissue is made up of narrow trabeculae with mainly red, blood-forming (hematopoietic) bone marrow. The cancellous trabeculae display noticeable functional alignment based on lines of traction and pressure initiated by tooth and muscle stresses.This means that the arrangement of the cancellous trabeculae adapts to changing stresses. The internal alveolar wall to the tooth sockets is a rigid but greatly perforated cortical layer.This bony layer is known as the cribriform plate (lamina cribriformis). It is particularly highly perforated in the cervical and apical areas.The openings correspond to the Volkmann canals and connect the periosteum to the bone marrow spaces through which blood and lymph vessels pass. Bundles of Sharpey fibers are embedded in the cortical layer of the alveolus, similar to the situation in the ce-mentum. The composition of the alveolar bone is the same as that of other bones: 45 parts by weight inorganic hydroxyapatite (calcium phosphate), 30 parts by weight organic matrix comprising collagen fibers, and 25 parts by weight water. The shape and position of the alveolar bone is determined by the teeth and their function: The mandibular incisors are inclined in a vestibular direction, the mandibular canine stands rather perpendicular, and the mandibular molars and premolars have a tendency to a lingual positioning. Following tooth loss, the osseous lamellae of the alveoli are resorbed as the thin bony parts shrink considerably (Fig 6-23). It appears as if the alveolar ridges are shrinking in the direction of inclination, which changes the path of the mandibular alveolar ridge into a trapezoidal, tapering shape. The root apices of the molars lie inferior to the border of the floor of the mouth. The root apices of the anterior teeth are the most distant from the mandibular canal, while the distance is smaller with the posterior teeth. Consequently, the roots of the third molars are very close to the mandibular canal and may even encompass it.